North Seal River Lodge offers you an experience no other Canadian lodge match. An exclusive 5,000,000 acre area, exquisite accommodations, a grand lodge, warm , personalized service, and Canada’s most exciting multi-species trophy fishery make for the epitome of Canadian fishing trips. You’ve never experienced anything like Gangler’s North Seal River Lodge. But we promise, once you do, you’ll want to make it a habit. Here’s what makes Gangler’s so special! Established in 1985, Gangler’s has long been recognized as the benchmark for extraordinary Canadian fishing trips. Gangler’s North Seal River Lodge and outposts were opened in 1998 and is the third lodge / fishery we have developed in our 25 years. Why the North Seal? We had already developed two very successful lodges and could have easily have stayed where we were. However, the North Seal was a once-in-a-lifetime opportunity simply too special to pass up. The North Seal River area was the last undeveloped Canadian fishery below the treeline, almost 200 miles from the closest road. There are no other lodges in this area, no roads, no communities and no commercial fishing. It’s a vast stretch of untouched water and wilderness. Our exclusive allocation stretches over 7200 sq. miles, a unique area where 12 river systems merge to form over 100 lakes and merge with one of Canada’s greatest rivers, the North Seal. The fishery is truly special – offering Canada’s finest opportunity to enjoy trophy fishing for the Canadian Grand Slam (northern pike, lake trout, walleye, and arctic grayling) in one setting. The waters are comfortable and diverse, ranging in size from 6 to over 20 miles long, offering protected water with no long boat rides. 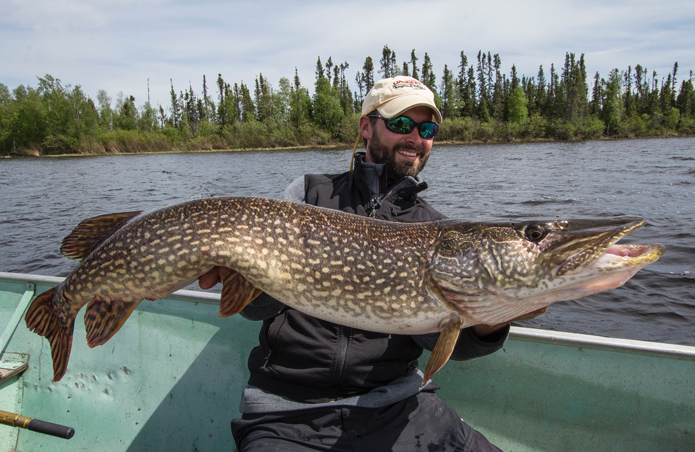 In 2008, Gangler’s boasted Manitoba’s largest pike and lake trout and 7 out of the top 15 pike taken in Manitoba. A great fishery is only as good as the outfitter who develops it. Our reputation is founded on over 30 years of experience and referral and another 10 as guests. Yes, well before we became outfitters, we were guests ourselves, with Canadian trips an annual family tradition. Along with great fishing, we recognized the other important intangibles- warmth, ambience , first-class equipment and accommodations – that create a truly memorable trip ! It is with all of these intangibles in mind that we designed our first lodge. One extremely important intangible is size. Many Canadian lodges hold 40,50, even 60 people. As nice as they may be, it just doesn’t make sense to us to fly to a remote camp just to settle in with another horde of people. That’s what guests are trying to leave behind. If leaving the dock in the morning resembles rush hour in Chicago, what’s the point? At Ganglers, we have made camp sizes a priority and our philosophy is to keep our camps small. By limiting the main lodge to only 24 guests and the outposts to 8 each, each guest is ensured the personalized attention he or she deserves. Each camp is designed to be unique in layout and flavor and all accommodations are 5 star and recognized as the finest in the North. This is the story behind Ganglers. An outstanding fishery, run by a family of outfitters with a proven record of providing Canada’s finest fishing trips. Quality, quantity, variety in a first-class setting. Dream a little bigger... and let us turn it into reality. ​Ice-out, water temps, and weather dictate the behavior in June. Ice-out is generally late May to early June. Fishing is generally very shallow for all species. This is the time many pike fishermen dream of, with pike warming themselves in 8-12” of water early on and moving to 2-4’ of water later in the month. Many a pike addict has turned into quivering jelly at the sight of so many big fish so shallow and in clear water. There are no significant weeds at this time so the pike will hide in the boulders if not in the shallow sandy bays. Depending on the time of ice-out, they will start to move slightly deeper late in the month. Later in June, the males get more active and can be caught on almost anything. Big females are recovering from the spawn but can be caught with slow moving lures or flies. After you make the short trek from our landing strip and check in with the Main Lodge you will retire to your cabin to find all your gear and luggage waiting for you. At this point you will be anxious to get out on the lake. You‘ll take a look around the cabin and notice its various appointments – Screened in porch with chairs, two rod holder racks, full bath, 2 full size beds per room, dresser, nightstand, TV, VCR and or DVD, table and chairs (in four man cabins), couches, coffee table, propane heater, coffee maker, extra pillows, linens and blankets, towels, soap, closets and plenty of hooks and hangers around. All cabins are fully carpeted. Whether you choose to use it or not, you will notice that from your cabin you will have WiFi access to the internet. Once organized and settled in, it’s off to the lake and fishing. Upon returning from the afternoon fishing you’ll return to your cabin and freshen up for dinner and kick back to rehash the afternoon. At the Lodge, cocktails and complimentary hors d’ ouveres are served between 5pm and 7pm. Dinner is served promptly at 7pm. Getting to the far North has never been so easy. Guests depart for Gangler’s Lodges early Saturday morning in our private charter from Winnipeg, Manitoba directly to our main lodge. Occasionally there is a brief stop in Thompson. Normal flight time is 2 ½ hrs. The charter lands on our 5400’ airstrip right behind the lodge. Main lodge guests are served lunch and will be out on the lake before noon. 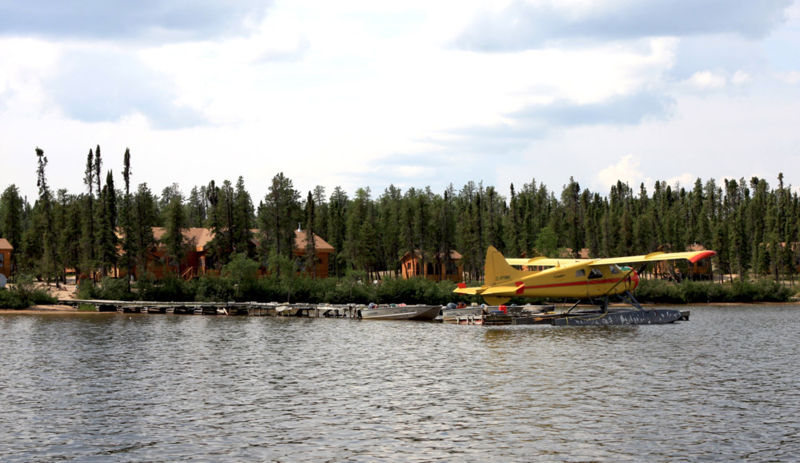 Outpost guests are only a short float plane trip away to their respective camps. Getting home is even easier. Guests traveling to most U.S. destinations are home the same day from departing camp. Convenient travel is part of our commitment to your trip – a very important part. The land around North Seal River Lodge is unique. Two hundred-foot high sand dunes, called eskers, slash across the landscape, some 100 miles or longer. The aboriginal people called this “ The land of little sticks” – forests full of birch and jack pine cover the ground as if they popped up only yesterday. This is the sub-arctic, home to the transitional forest., where forest and tundra merge. On the ground or in a boat, you’re bound to see moose, bear, wolf, eagles and more wandering around as they did centuries ago. You’ve never experienced anything like North Seal River Lodge. But we promise, once you do, you’ll want to make it a habit. “Unbelievable!” is the expression most often heard when guests enter the main lodge. Whether it’s your first visit or fifth, the lodge is simply as grand as they come with a classic Northwoods charm. Soaring beams, beautiful wood finishes, a majestic fireplace and spectacular scenic views form a masterpiece. Over 4200 sq. ft, its grand interior offers comfortable lounging areas, a pool table, card table, ping pong table, tackle room, complimentary computer, free wi-fi, a complimentary fly table, and complimentary DVD library and the rustic Timberwolf bar. The cabins are just as spectacular. Each features a beautiful sitting area, screened-in porch, comfortable beds, thermostatically controlled heat, TV/VCR, and one full bath for every two guests. Four person cabins feature a private bath off each bedroom and an additional table area with seating for four. 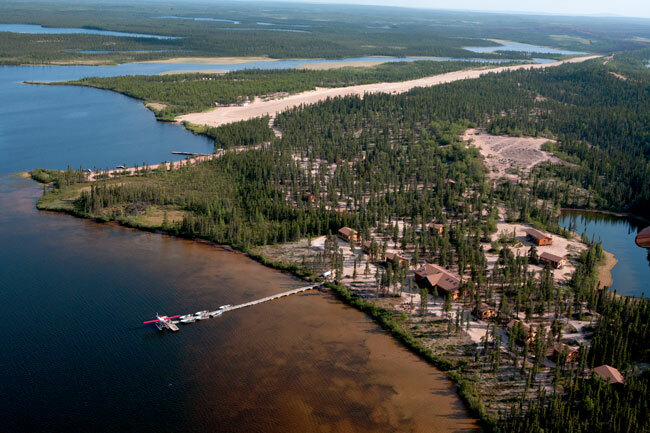 ​The most amazing thing about Gangler’s North Seal River Lodge is that it is limited to ONLY 24 guests per week. It’s a warm, intimate setting, with personalized attention to North Seal guide every facet of your trip. To ensure this is an unrivaled staff to guest ratio of 1:1—each staff member dedicated to your satisfaction. But a great lodge must have an outstanding fishery. The main lodge offers exclusive access to over 30 lakes and 12 river systems sprawled over our vast area. Huge pike, lake trout, walleye and arctic grayling abound here. Most lakes feature all four species, and most are fished only a few days a year, guaranteeing a truly virgin fishery year after year. A spectacular lodge. Beautiful cabins. Personalized service. And world-class fishing. Gangler’s North Seal River Lodge, is a unique, one-of-a-kind experience. Limited to only 24 guests per week, Gangler’s is truly dedicated to the satisfaction of our guests. Every detail is attended to by our staff to ensure your trip exceeds your expectations. From the coffee delivered to your cabin each morning to the deluxe cabin service, we will make sure all your needs are met – even those needs you didn’t think you’d have. Got a special request? We will do our very best to accommodate you. Always a treat, Gangler’s dining is a 5 star experience. We strive to strike a balance between 5 star cuisine without sacrificing the heartiness great fishing demands. 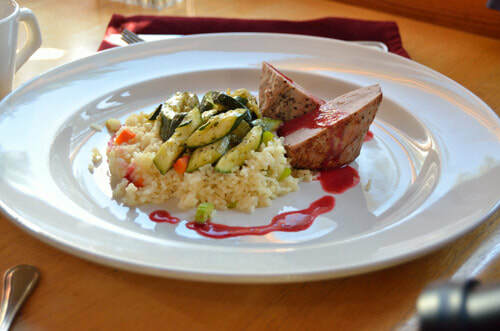 From apricot glazed cornished hens, steak dinner, encrusted leg of lamb with rosemary potatoes or the perfectly cooked prime rib with a maki style cucumber wrapped salad, each dining experience is a delight. 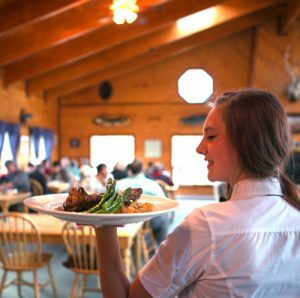 With its combination of fishing quality and diversity, Gangler’s North Seal River Lodge has been described by many guests as ‘The Ultimate fishing menu.’ Start with our vision of the main lodge. We specifically designed NSRL as a small, exclusive lodge where guests are treated to the personal attention and detail that has become our hallmark. Limited to only 24 anglers per week, the main lodge’s exclusive fishing grounds stretch over 7200 sq. miles. That’s over 5,000,000 exclusive acres, unheard of. Home to over a hundred lakes and twelve river systems, the choices are endless. Each body of water has its own distinct character, its own distinct legacy. Most of the lakes range in size from 6 to 20 miles long, offering great angling with no long, uncomfortable boat rides, allowing maximum time spent fishing, not traveling. The topography boasts many islands and points, offering excellent habitat and wind protection. The menu begins with access to sprawling Egenolf Lake, a major junction of the North Seal. These trips are truly unique, a one-of-a-kind experience and have proven extremely popular. For fly-outs, we have boats on over 25 different lakes, assuring all of the water remains incredible and as close to virgin as possible. Some of these lakes may only see six anglers a year! We even have two camps in the Barrenlands near the Manitoba/Nunavut border. Main lodge guests now have over 30 different lakes via portage or fly-outs at their beck-and-call. No other lodge in the Canadian North can offer this diversity and selection in their regular package. We’ll use our hands-on experience to help you a craft a fishing package customized to fulfill your dreams. Ganglers – the ULTIMATE Canadian angling experience. Gangler’s Internet service is unique among lodges. We hot-wired the ENTIRE camp. Each cabin not only has wireless but its own land line. The wireless capability actually extends out to the front benches overlooking the shoreline. Of course you can just ignore the internet and enjoy the remoteness as well. At Ganglers’, we are forever improving the ideal Canadian fishing experience! Copyright 2015 Strip Strike University. All Rights Reserved.